I've got nothing art-wise for you today. So here is a picture of Misha and I bonding over some Beatles. 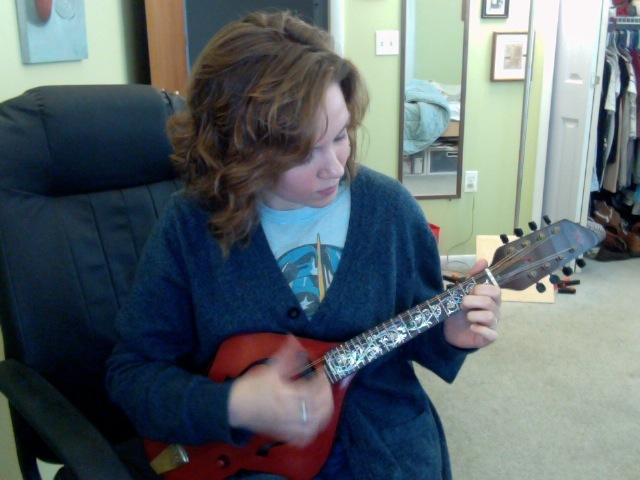 In case you were not aware, Misha is my brand new mandolin that my father made (completely and fully from scratch) for me. Note the bizarre shape of the body; I redesigned it it be easier to hold and my dad did the rest. I'm really proud of my dad's handiwork so I'll post better photos after it's undergone its finishing touches. "Misha" because the laquer makes it smell like a matryoshka doll.